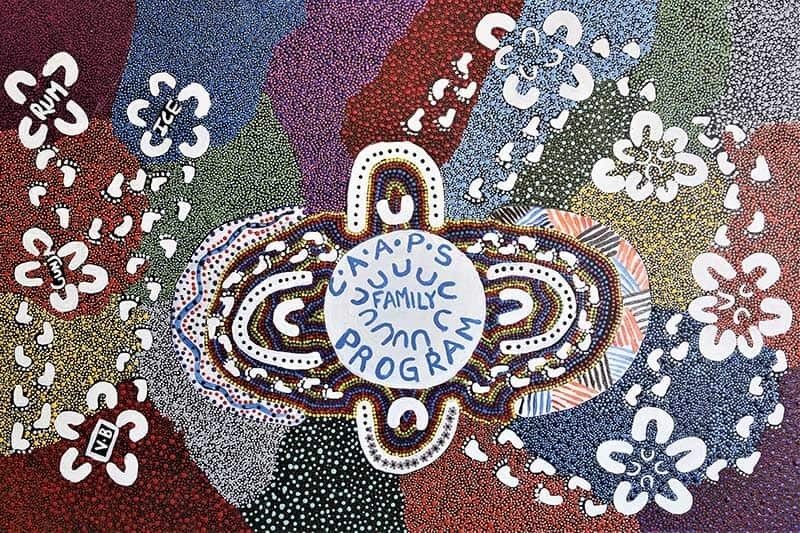 This painting welcomes guests and visitors to CAAPS. It shares with us the story of wandering in crisis with the challenges in life on the left. It represents seeking help from family and gaining their support in beginning the journey in CAAPS to become healthy and strong. When the journey at CAAPS has completed, community and family are there waiting; but CAAPS will be there if ever needed again. We acknowledge the traditional owners and custodians of country throughout Australia and their continuing connection to land, sea and community. We pay our respects to them and their cultures, and to their elders both past and present. Photograph Disclaimer: These pages may contain images of and reference to both living and deceased Indigenous people from diverse cultural backgrounds and communities. Please contact CAAPS if you have concerns with any material on this website. If you are in mourning or have sorry business, you can hide these images while viewing the website. These pages may contain images of and reference to both living and deceased Indigenous people from diverse cultural backgrounds and communities. If you are in a period of grieving, we recommend hiding images on this website.